Water is an international affair. We are connected globally through our rivers which flow to the sea, and through trade of food and manufactured goods, all of which contain "virtual water," the water used to grow the food or manufacture the car. We are also connected by the impacts of water—especially lack of water, which sparks war and instability, creating water refugees who become migrants seeking a better life. And we are connected through shared ideas, concepts, values, and ethics about water. Though our native cultures and religions are often different, the ideas and values of water professionals reflect globalized concepts stemming from the legacies of former colonial or otherwise hegemonic powers active in water development and education: The Netherlands, Britain, France, as well as the United States, Russia, and more recently, China. Through attending universities and studying standard water science (usually reflecting a Western materialist bias), and synchronizing new ideas through regular international water conferences, a unified global water consensus has emerged, reflecting neoliberal concepts of water as a resource to be used for economic advancement. This consensus is represented, inter alia, by the World Bank, the Global Water Partnership, the World Water Council, the International Water Association, and other think tanks and professional associations. This neoliberal view of water as a resource to be used for economic benefit clashes with values of biodiversity conservation, rights of nature, social justice and rights to culture (e.g., the UN Declaration on the Rights of Indigenous Peoples). Though the neoliberal consensus does subscribe to basic principles of environmental sustainability and human rights, these considerations serve as general guidance but not core principles. The view of water as an economic resource inevitably leads to extractivist tendencies. Both China and Laos, for example, plan to expand their construction of mega dams on the Mekong River and its tributaries, to meet their insatiable demand for electricity. These plans spell disaster for the fish, farms, communities and countries downstream. There are alternative ways to generate electricity, but there is only one Mekong River. In the United States, we have largely completed our era of building big dams, but we are poised to do equal damage to the environment and Native cultures through projects such as the Pebble Mine in Bristol Bay, Alaska, a proposed gold and copper mine which would be disastrous for salmon fisheries. Meanwhile in the Four Corners region of the U.S. Southwest, contamination of groundwater from legacy uranium mining and milling, mostly on Native lands, continues to render more and more groundwater wells unusable. But this is not only a mistake of the past; new uranium mining is still being proposed for these same areas. The conventional neoliberal water consensus is not really working. Particularly in developing countries, water inequities are increasing, while the health of water ecosystems is declining. Yet dams that displace huge numbers of people and destroy river ecology, along with mines, which poison downstream communities, continue to be supported by governments for their short-term economic benefits. As long as dams are justified on the basis of easily quantified benefits (how many megawatts of electricity produced), rather than assessed on the impossible-to-quantify costs to Indigenous cultures, aquatic biodiversity, and harmony with nature, cost-benefit analysis will favor dam construction. Even though progressive economists recognize multiple water values beyond the purely economic, policy makers seem incapable of accommodating those fuzzier values when practical decisions are made. Einstein famously quipped that "We cannot solve our problems with the same level of thinking that created them." 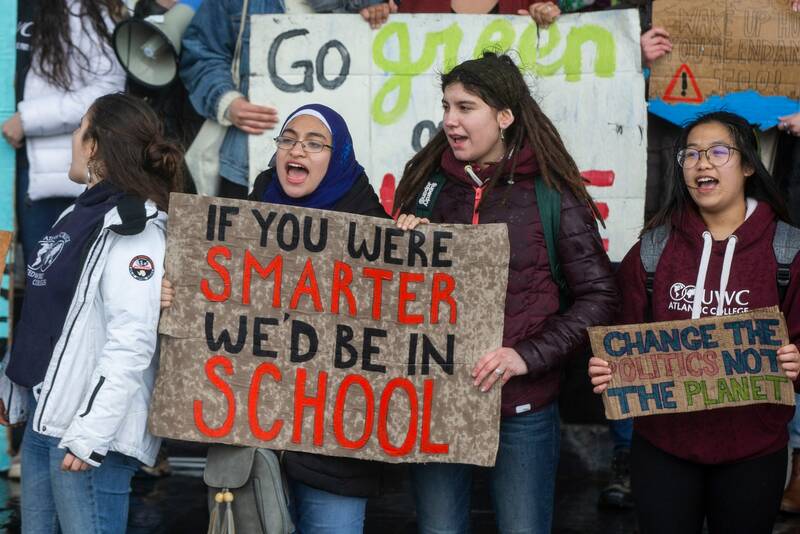 The global children's climate strike last week (March 15) offers a much needed corrective to global inaction on climate. The young generation is fighting for their survival, while the adult population seems content to fiddle while Rome burns. One sign read, "If you were smarter, we'd be in school!" Behind the clash of perspectives that is pitting children against adults is a clash of fundamental ethical principles. The children are reminding us that everything is connected and that we are responsible for respecting the whole, including nature, other people, and future generations. Adults who have been socialized into the "what's mine is mine" ethos of capitalism, are adept at placing their own individual interests first and foremost. We (in the U.S.) even have a president extolling separation and individualism as virtues. Einstein reminds us that the level of thinking underlying the twin crises of climate change and water scarcity is not the thinking that can save us. On this World Water Day (March 22) we urgently need a campaign to disrupt global complacency about protecting the planet's water. We adults, who are in charge of today's policies about water and energy, are doing the same thing to rivers, lakes, and the oceans, as we are doing to the climate: exploiting and extracting as much as we can and as fast as we can without thinking about our children's welfare. What kind of parents have we become? So far our children have kept their focus on climate change and have not blamed us for the crisis of dying rivers and contaminated water. But the same concern our children are showing for our collective house, which in the words of 15-year old activist Greta Thunberg "is on fire" is also needed for protecting our common waters, which are drying up. In both crises, climate and water, the causes are well known, but the solutions demand new levels of cooperation and collective action. The stories of water injustice that are displayed in our newspapers and on our devices are all about the clash of connection vs. separation. The newly recognized dangers of water contamination from PFAS chemicals (used in Teflon, Goretex, and fire-fighting foams) have been known for half a century, but were successfully covered up by Dupont and 3M in a classic response of protecting individual (corporate) interests. The Flint story of (mostly) Black families poisoned from drinking city tap water is about racism and politics, and the Standing Rock story is also about racism and politics, plus corporate greed, and climate denial. The Dakota Access Pipeline will feed the flames burning our collective house. The attack dogs unleashed on Native Water Protectors stands as a powerful symbol of separation mentality. Our 20th Century parents could claim that they didn't know any better, but today's generation of adults cannot use that excuse. John Muir, one of the fathers of America's environmental movement, wrote that "When we try to pick out anything by itself, we find it hitched to everything else in the Universe." This concept suggests why the children's climate movement is potentially so significant. By shaming the adults to take action on climate, we might realize that our actions pertaining to water also need to change. In a recent special report on water, The Economist (March 2, 2019 issue) offers the depressing conclusion that the global water crisis is due not to any actual water shortage or lack of technology, or to climate change (though it's certainly a factor) or lack of management expertise, but to dysfunctional politics beholden to special interests. This seems broadly correct, but how are we to cut through those powerful special interests? This is where ethics comes in. Ethical thinking is a departure from the neoliberal water paradigm where the concept of "ethics" is rarely encountered. By orienting our thinking and our imaginations towards what is good for the collective, including both people and nature, we start to see water and water ecosystems as partners in charting new solutions that meet multiple functions. We also become more aware of value principles that need to be integrated into any desirable solution: social justice, cultural rights, rights of nature, the precautionary principle; these serve as design parameters for ethical water actions. An example of applied water ethics is the Ethics and Treaty Project aimed at revising the 1964 Columbia River Basin Treaty between Canada and the United States. That treaty ignored the rights of Native Peoples (US Tribes and Canadian First Nations), and similarly ignored the ecological health of the Columbia River and its many tributaries. Through a series of dialogues among Tribes and First Nations, religious leaders, and other stakeholders, a Declaration on "Ethics and Modernizing the Columbia River Treaty" was drafted as a basis for proposing revisions to the follow-on treaty scheduled to take effect from 2024. Ethics are also being applied in many other contexts, though usually without being identified by the terminology of ethics. The ongoing restoration of the Los Angeles River is an example of learning to see a beleaguered river as an opportunity for urban revitalization, and there are similar initiatives worldwide to restore river health. What has been missing from these efforts is the explicit understanding of the ethical principles that are being tacitly applied. Water ethics is an emerging field that dates back only to the late 1990s when UNESCO launched a study of "water and ethics" which produced an initial batch of reports in 2004 and stimulated other initiatives. Many of these reports are open access and can be found on the website of the Water Ethics Network. Just as medical ethics shifted our values about how to determine an appropriate treatment protocol for a given patient, or how best to invest in public health, the explicit application of water ethics could help sort out the complicated pros and cons of water decisions. An interest in water ethics, however, needs to start with an awareness that there are ethical principles at stake in the way we manage water and water ecosystems from rivers to lakes to wetlands and groundwater. The children leading the global climate campaign are reminding us of our ethical responsibility to future generations and to the wellbeing of the whole planet. Our children can be our motivation, but we are the ones who need to act.